This week we’re joined by Dr. Carmen Echols of Flat Shoals Internal Medicine, a DeKalb Medical Physicians Group. Dr. Carmen Echols is a board-certified family medicine physician. 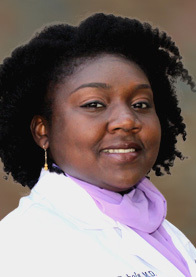 She received her bachelor’s degree in Biology from Xavier University of Louisiana, her medical degree at Wayne State University in Detroit, Michigan, and completed her internship and residency in Family Medicine at Georgia Health Sciences University in Augusta, Georgia. Dr. Echols’ special medical interests include adolescent medicine, diabetes, hypertension, women’s health, and integrative and holistic medicine. She is a member of the American Academy of Family Physicians and Georgia Academy of Family Physicians. She is also a member of Gamma Gamma Chi Sorority, Inc.
Dr. Echols enjoys doing volunteer community service, West African dance, attending cultural events and festivals, traveling and gourmet cooking. She lives in the Stone Mountain area with her husband and English Bulldog.